TIKITANO CHRISTMAS SPECIAL – with the cast of Encore! 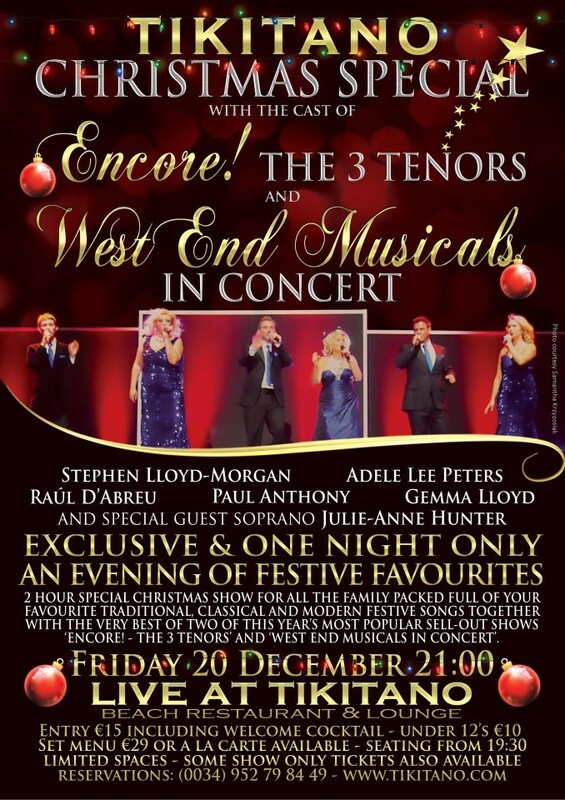 The 3 Tenors; West End Musicals in Concert with special guest Julie-Anne Hunter | Marbella Marbella – Adelante! IT´S NOT TOO EARLY TO BOOK FOR OUR CHRISTMAS SPECIAL!! 2 HOUR SPECIAL CHRISTMAS SHOW FOR ALL THE FAMILY PACKED FULL OF YOUR FAVOURITE TRADITIONAL, CLASSICAL AND MODERN FESTIVE SONGS TOGETHER WITH THE VERY BEST OF TWO OF THIS YEAR’S MOST POPULAR SELL-OUT SHOWS AT TIKITANO ‘ENCORE! – THE 3 TENORS’ AND ‘WEST END MUSICALS IN CONCERT. menú de 3 platos 29€ o a la carte desde las 19:30. Disponibilidad limitada – también hay tickets de sólo actuación. Shill, Screwball, Dr. Who and the Constant Unknown. Disclaimer: The views, opinions and positions expressed within this guest article are those of the author Nick Holland-Morgan alone and do not represent those of the Marbella Marbella website. The accuracy, completeness and validity of any statements made within this article are not guaranteed. We accept no liability for any errors, omissions or representations. The copyright of this content belongs to Nick Holland-Morgan and any liability with regards to infringement of intellectual property rights remains with the author.